ViewSonic® Corp., a leading global provider of visual display, computing and digital content solutions, today announced the commercial availability of its PJD5352 portable 3D-capable short throw projector. 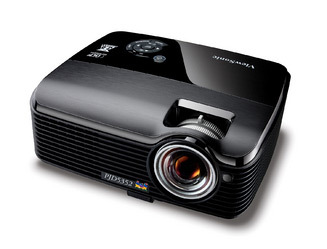 An advanced short throw DLP projector, the PJD5352 is ideal for giving both multimedia lessons in the classroom and dynamic presentations in the boardroom. Equipped with BrilliantColor™ technology, a short 0.9 throw ratio and 1.2X optical zoom, the PJD5352 produces a 50” image with life-like color and clarity at a distance of only three feet away. Delivering 2,600 lumens with a 1024×768 XGA native resolution and 3,000:1 contrast ratio with DCR, this projector performs in even the brightest environment. With an amazingly fast 120Hz frame rate and integrated 5W speaker, this versatile projector supports Texas Instruments’ DLP® Link™ technology, making it optimized for 2D and 3D performance. At just 5.5 lbs., this projector is designed for tabletop use or it can be mounted on the wall with an optional short throw mount. Several other convenient features include multiple preset presentation modes, closed captioning for the hearing impaired, an “Off to Go” feature for bypassing the usual cool down phase and a Kensington security lock and security bar for increased theft deterrence. For power consumption, the PJD5352’s Eco Mode offers up to a 6,000-hour lamp life and reduced noise, and <1W energy usage with its Power Saving Mode. Teamed with a filter-free design and non-degrading DLP light engine, the PJD5352 provides for easy maintenance and one of the lowest total costs of ownership (TCO) in the industry. The ViewSonic PJD5352 is currently available with an industry-leading three-year limited parts and labor warranty for an ESP of $749. Microsoft and Yahoo Sign a Deal!